After an extremely cool December, the housing market is starting to warm up a bit. Demand is rising and the market is starting to move its way towards a balanced market. The active listing inventory increased by 211 homes in the past two weeks and now totals 6,122, a 4% rise. Last year, there were 3,774 homes on the market, 2,348 fewer than today. That’s 62% more homes than last year. Demand: the number of pending sales over the prior month, climbed in the past two-weeks by 270 pending sales, up 21%, and now totals 1,435, its lowest level for this time of the year since 2008. Last year, there were 1,764 pending sales, 23% more than today. 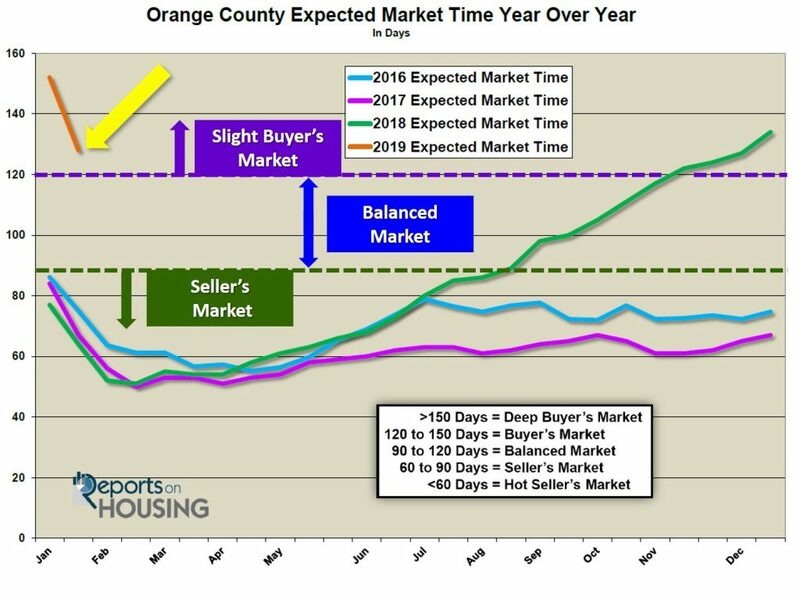 The Expected Market Time for all of Orange County decreased from 152 days two weeks ago to 128 days today, a slight Buyer’s Market (between 120 to 150 days) and the highest level for this time of the year since 2011. It was at 64 days last year. For homes priced below $750,000, the market is a Balanced Market (between 90 and 120 days) with an expected market time of 97 days. This range represents 44% of the active inventory and 58% of demand. For homes priced between $750,000 and $1 million, the expected market time is 102 days, a Balanced Market. This range represents 18% of the active inventory and 23% of demand. For homes priced between $1 million to $1.25 million, the expected market time is 156 days, a Buyer’s Market. For luxury homes priced between $1.25 million and $1.5 million, in the past two weeks, the expected market time decreased from 252 to 185 days. For homes priced between $1.5 million and $2 million, the expected market time decreased from 365 to 305 days. For luxury homes priced between $2 million and $4 million, the expected market time decreased from 347 to 314 days. For luxury homes priced above $4 million, the expected market time decreased from 1,279 to 794 days. Homes above $1.25 million, accounts for 30% of the inventory and only 13% of demand. Distressed homes: both short sales, and foreclosures combined, made up only 0.9% of all listings and 2.1% of demand. 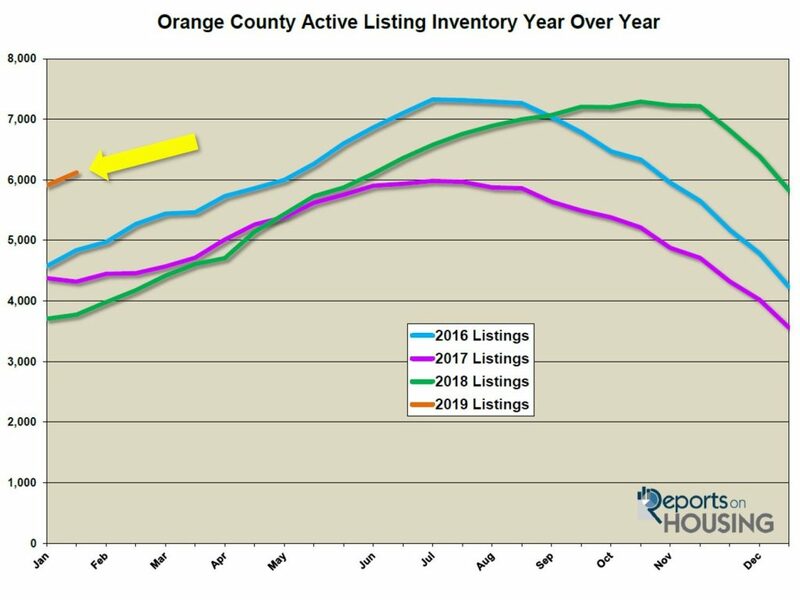 There are only 17 foreclosures and 39 short sales available to purchase today in all of Orange County, 56 total distressed homes on the active market, down 11 from two-weeks ago. Last year there were 47 total distressed homes on the market, slightly less than today. The best time to sell a home, with the lowest Expected Market Time readings for the year, occurs from the Super Bowl through mid-May. This year will be no exception; it just will not be as robust as the past seven years. Many homeowners and sellers are holding their collective breath with high expectations for the Spring Market. Remember, right now it is still a slight Buyer’s Market. It will drop down to a Balanced Market, NOT a Seller’s Market. It will remain balanced until mid-May. That is when demand will remain relatively the same while more homes come on the market. As a result, the Expected Market Time will rise from mid-May through the Summer Market.